Hiddenbed was developed in 2003, in Uruguay by Juan Carlos Monestier, a mechanical engineer who desperately wanted a solution for his space problems when his son returned after graduation to live in their modestly sized family home. The invention was an instant local success, was internationally patented and first shown in the USA on the Oprah Show. In the following years licences were granted to a number of countries, including the USA, Japan and Canada. Early in 2009, businessman Peter Algie became aware of the novel concept on the internet and quickly realised that it would be a great product for New Zealanders. After some further internet research he contacted the patent owners in Uruguay to find out more. As it turns out, Peter's background and his successful joinery business, put him in good stead to secure the Hiddenbed license for New Zealand and Australia. 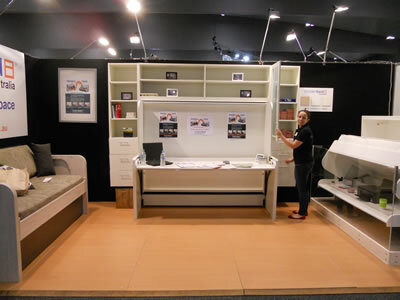 He decided on a 'trial run' at the Wellington Home Show in order to test product acceptance and to gain feedback; he subsequently launched into full product development. As license holder, he receives the original patented swivel mechanism while the entire unit is built at the Hiddenbed joinery factory in Greytown from where it is shipped nationwide. The models available in New Zealand are a direct result of Peter's design and joinery expertise. He has developed the Hiddenbed designs in response to Kiwi preferences and requirements and with consideration for local materials. 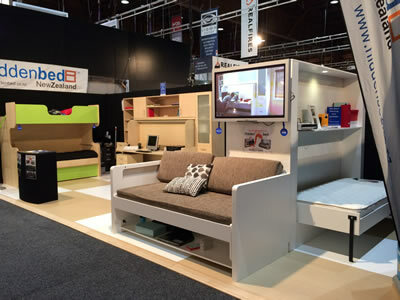 Peter continues to develop the product range and has launched Hiddenbed in Australia. To get the best available fold away bed visit our showroom, Call 0800 40 40 90 or email us today!